Continuity mistake: Burt Lancaster is sitting in his car at the end, and he asks the tower if he can listen to the radio traffic for the incoming plane that's landing. The tower replies "Sure, it's on frequency 117.1". Burt then tunes the dial on his receiver to 171, not 117. 170 is blatantly written under the dial in bold type. Factual error: In the scene where Joe Patroni is attempting to move the stuck 707, Bakersfield is standing beside his car watching, very close to the plane. Without some form of hearing protection, he would have been very quickly deafened by the noise - a 707 at takeoff thrust is incredibly loud. I once watched a 707 take off from about a half mile away and forgot to cover my ears - it was so loud it actually hurt. Other mistake: When the stricken airliner is on final approach for landing, both pilots stare intently out the windscreen, never so much as glancing down at the flight instruments. In an instrument landing the pilot must look continuously at the instruments until the copilot reports that the runway is in sight, as that is the only way he can follow the controller's instructions. Trivia: The film was based on actual events. Trivia: Dean Martin received ten percent of the film's gross. Ada Quonsett: My late husband taught me to be thorough. He was a teacher of geometry. He always said: "You must consider every angle." Tanya Livingston: My late husband was a lawyer, and he always said: "Watch out for sweet-looking innocent, little old ladies." I'm beginning to understand what he meant. Tanya Livingston: There's bound to be a passenger with a fifty-dollar wrenched back. I'd better get out there with some release forms and plenty of sympathy and understanding. Mel Bakersfeld: Don't talk to me about consequences! When Congress voted to cut airport appropriations, you never even sent in a letter of protest. And where were you when the airlines and the pilots and the rest of us were... were pleading for... for more airports and better traffic control? You were picking out the colors in the ladies' lounge. So now you've got your consequences. 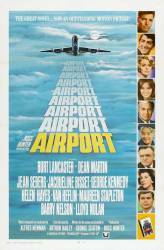 Question: Near the end of the film, the plane stuck on the ground is pressurised before it can move out of the way. Why is it pressurised if it's on the ground and not in the air? Chosen answer: Patroni isn't referring to the cabin pressure, he says to "pressurize the manifold" - part of the engine start procedure of a Boeing 707, which I believe involves a ground crew pumping gas (nitrogen?) from a cart into the intake manifold. Question: First there's a scene showing the "Golden Argosy" flight crew taking a mini-bus out to the plane (which, I assume, is already at the gate). The next scene shows Vernin Demerest and Gwen Meighen alone on the plane talking about her being pregnant, etc. Later in that same scene we see the rest of the crew getting onto the plane while Demerest and Meighen are all-of-a-sudden pretending there's a problem with a light. My question is this: If they all went out to the plane together on the bus where were the rest of the crew while Demerest and Meighen were talking on the plane? Wouldn't the whole crew have arrived together and got onto the plane together?